Since its market introduction in 2014, the Mazda3 has always been popular with buyers from the Lachine area. A glance at the vehicles you see on the road is enough to confirm just how popular the Mazda3 is. For 2016, the Mazda3 continues to offer everything that has made it so successful including two SKYACTIV engines which are both powerful and fuel-efficient, as well as several versions that fit any budget. With four versions in total (G, GX, GS and GT) and two types of body configurations, there is a 2016 Mazda3 for everyone at Spinelli Mazda in Lachine. Starting at $15,550, the Mazda3 comes standard with a SKYACTIV-G four-cylinder, 2.0-liter engine that delivers 155 horsepower and 150 lb-ft of torque. This engine can be mated to a six-speed SKYACTIV manual transmission or a six-speed automatic gearbox that also features SKYACTIV technology. The latter ensures that the Mazda3’s automatic transmission features the best from both a dual-clutch transmission and a continuously variable transmission. Regardless of the transmission you choose, the 2016 Mazda3 now available in Lachine is particularly fuel-efficient. It has an average fuel consumption rating of 7.9 liters per 100 kilometers in the city and 5.7 liters per 100 kilometers on the highway with the automatic, and 8.0 liters per 100 km and 5.8 liters per 100 kilometers on the highway with the manual. The other engine offered in the GT model is a four-cylinder, 2.5 liter unit that delivers 184 horsepower and 185 lb-ft of torque. This engine proves to be one of the most powerful in its segment, but it is still quite efficient with an average fuel consumption rating of 8.2 liters per 100 kilometers in the city and 5.9 liters per 100 kilometers on the highway with the six-speed automatic transmission coupled with Mazda’s exclusive i-ELOOP technology. 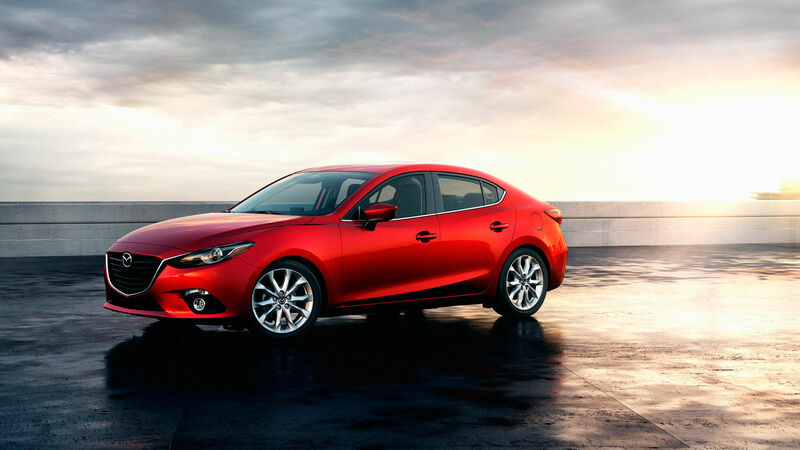 As noted above, the 2016 Mazda3 offers many versions and quite a lot of equipment. It comes standard with keyless entry with push button start plus electric windows and doors. You will find in the other versions heated seats, a sunroof, navigation system, leather seats and a range of active safety systems grouped in the i-ACTIVESENSE option. To learn more about the new 2016 Mazda3 now available at Spinelli Mazda in Lachine, contact us today!